Selected Science News: MORE HURRICANES IN GREENER SEAS? More hurricanes may form in greener waters, where sunlight tends to be absorbed at shallower depths, than in clear seas, according to new research that draws a link between ocean color and the formation and movement of tropical cyclones. It’s no secret that hurricanes depend on a recipe of moist air, warm water and converging winds. But in a paper due to be published this month in Geophysical Research Letters, researchers from MIT and the National Oceanic and Atmospheric Administration’s Geophysical Fluid Dynamics Laboratory say ocean color — which is typically influenced by the concentration of tiny marine organisms — may also be a factor. Ocean color varies around the globe. 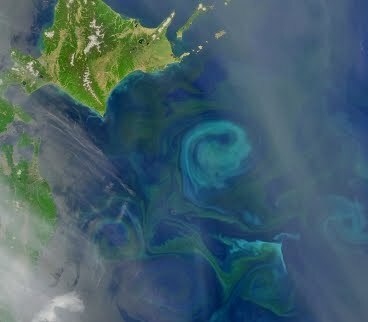 In the northern Pacific Ocean, the sea surface is dark green because it is packed with sediment and microscopic plants known as phytoplankton that absorb sunlight and keep the ocean’s surface warm. But the crystal-clear waters around the Bahamas lack biological material near the surface, and sunlight is absorbed much deeper. The depth of absorption is important because it affects ocean circulation, and ocean circulation redistributes heat throughout the world’s oceans, thereby affecting sea-surface temperatures. In their analysis, the researchers used computer models to simulate the effects of ocean color on the paths of tropical cyclones — commonly called hurricanes and typhoons. In one simulation, they depleted the phytoplankton in a large region of the North Pacific, which led to cooler sea-surface temperatures. This resulted in a 70 percent decrease in tropical cyclones in the area’s subtropical regions, and a 20 percent increase in tropical cyclones appearing close to the equator. That’s because without phytoplankton, the sea-surface temperature was warmer close to the equator but cooler in the subtropics. As a result, the storms formed closer to the equator where the water was warmer. “This research underscores how we’re trying to model such a complex system, and how we are probably missing some important physics in those models,” says Jim Kossin, an atmospheric research scientist with NOAA. “Ocean color is one example of that physics.” Although Kossin finds the link between ocean color and tropical cyclones “fascinating,” he points out that because the variability of ocean color isn’t yet well understood, the parameters used in the analysis may not be realistic. Emanuel cautions against interpreting the study as one that can be used to forecast hurricanes, stressing instead that the research more importantly highlights how closely life in the oceans is linked to the climate system. More than anything, he says, the research provides new impetus for using satellites to monitor ocean color. Although a NASA satellite has done this for about 12 years, budget cuts have threatened its future. New satellite data would help researchers like lead author Anand Gnanadesikan, an atmospheric scientist with NOAA and lecturer at Princeton, gain a better understanding of how global warming may affect ocean color. This relationship is still unclear, since previous studies have linked global warming to both an increase and a decrease in phytoplankton. “We are very interested in understanding how ocean color might change in the future, and how it might have changed in the past, and seeing whether we can attribute changes in sea-surface temperatures to those changes in ocean color,” he says of future modeling efforts.